Welcome to our One Minute Monday weekly blog where we outline a key finding from our research in under one minute! 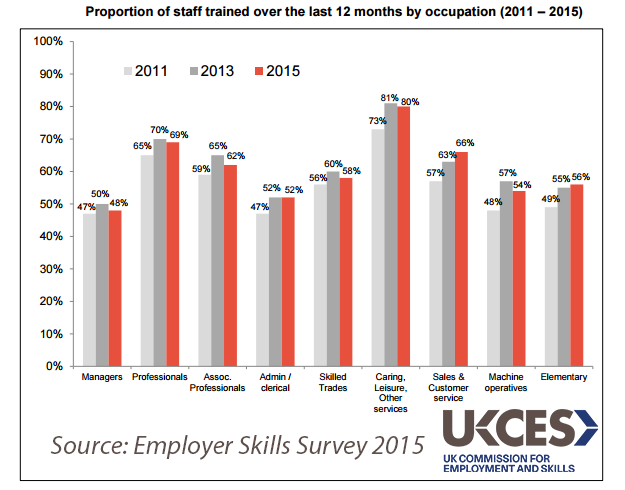 The majority (63%) of UK workers received training in 2015. The number of employers offering training and the amount they spent on development activities slightly increased from 2013. However, surprisingly, managers are the least likely occupational group to receive training, and the proportion of managers who received training actually fell from 2013 to 2015. Where training has increased it has been in the traditionally lower skilled occupations: sales and customer service roles and elementary occupations, such as farm hands and delivery drivers. All other occupational groups actually saw a slight a fall in the proportion undergoing training (apart from admin/clerical which remained at 52%). Training is one way employers can act to close skills gaps in their industries, but the only marginal increases in training suggest there is more that can be done. To find out more about training in the UK labour market check out Chapter 5 of our Employer Skills Survey 2015 or watch our animated summary of the findings.